At CESAR C. CRUZ & PARTNERS, we listen to you and respond to your needs. We build relationships, not just a business. Ours is a personal approach to the practice of law, guiding clients in every transaction, from concept to conclusion. Our lawyers are specialists in their fields, with a personal commitment to lifelong learning and adherence to high legal and ethical standards. Each member of our team possesses extensive experience in his or her specific practice, ensuring collective expertise in a variety of disciplines. Our team also includes a staff of efficient support administrators, ready to provide any needed backup for our projects. Mr. Cruz has built a reputable practice founded on a wealth of experience, an appreciation of each client's best interests, and convincing legal victories. He is well-versed in corporate transactions, securities issues, debt and equity offerings, corporate restructurings, establishing corporations, joint ventures, partnerships and other legal entities. 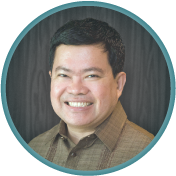 He has successfully negotiated collective bargaining agreements for major foreign and local corporations in the Philippines. His reliable judgment and keen insight on complex issues have helped resolve contentious labor and employment issues. Mr. Cruz has argued before the Court of Appeals and the Supreme Court en banc on various matters, including expropriation. 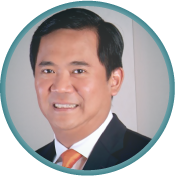 Among the notable cases he has personally attended to include a case whose ratio has been incorporated in the Rules of Court of the Philippines on the requisites for admitting depositions. 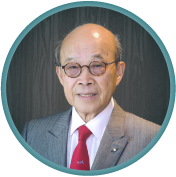 As a legal trailblazer, he was also intimately involved in leading Philippine cases regarding the nullification of spurious titles and the rules on breach and contract. Mr. Cruz sits in the Board of Directors of various corporations and serves as corporate secretary for several others. 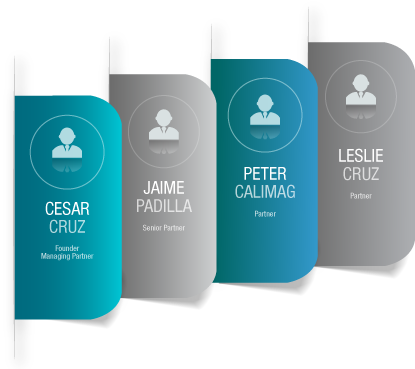 Mr. Padilla partners with each client to create quality solutions and provide straight answers. His singular focus, depth, and perspective, allows him to see both the big picture and the fine print in every case he represents. Mr. Padilla has successfully advocated clients’ interests in numerous employment-related issues and trademark cases. He has argued before the Supreme Court and the Court of Appeals on cases involving labor, corporation and intellectual property law. He has also supported Mr. Cruz in the landmark cases handled by the firm. Mr. Padilla assists and advises clients on other legal issues concerning employment standards, general corporate compliance and taxation. Mr. Padilla serves as the corporate secretary of several corporations. government and private industry events. Mr. Calimag represents clients before the courts and administrative agencies with the ultimate goal of protecting and enforcing their rights. His considerable experience and understanding of real-life complexities in business and litigation, help him determine strategic approaches and the best options that advance each client’s objectives and interests. Mr. Calimag's practice specializes in commercial law, where he assists clients in establishing corporations and other legal entities in the Philippines, concluding various commercial agreements, and providing general corporate, taxation and border protection advice. He assumes both director and corporate secretary positions in a multitude of corporations. Before joining the firm, Mr. Calimag served the Philippine government as the Assistant Secretary of Finance for Revenue Operations and Legal Affairs, supervising the Bureau of Internal Revenue, the Bureau of Customs, the Bureau of Local Government Finance, the Revenue Integrity Protection Service, and the Department of Finance's One-Stop Shop. As Asst. Secretary, Mr. Calimag oversaw tax treaty negotiation; tax treaty implementation; legislative liaison and coordination; diplomatic liaison; inter-agency coordination; administrative appeals from decisions of the Commissioners of the Bureau of Internal Revenue, the Bureau of Customs, the Insurance Commission, the Securities and Exchange Commission and the Bureau of Local Government Finance. He also handled administrative appeals in disciplinary cases involving personnel of the Department of Finance and its various attached agencies, and coordinating the activities of various Philippine government-owned and controlled corporations. Mr. Calimag further acted as the representative of the Secretary of Finance in intra-governmental bodies such as the National Intelligence Board, the Presidential Anti-Terrorism Council, the Philippine Center on Trans-National Crime, the Inter-Agency Anti-Graft Coordinating Council, the Civil Aviation Authority of the Philippines, Duty-Free Philippines, and the Optical Media Board. Prior to joining the government, Mr. Calimag was a Senior Associate at Quisumbing Torres Law Offices (affiliate office of Baker & McKenzie) and at Angara, Abello, Concepcion, Regala & Cruz Law Offices (ACCRALAW). Ms. Cruz provides proactive advice to big and small businesses, serving both multinational and domestic clients. Like her partners in the firm, she is committed to provide prompt, thorough work with a keen eye on the client’s bottom line needs and overall interests. Her strategic counseling covers obtaining, protecting, licensing and enforcing intellectual property, as well as protecting these rights before the courts and administrative agencies. 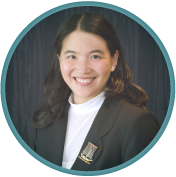 Recognized for her discerning insight, particularly on intellectual property issues, she has been regularly invited to speak on different IP legal issues at various corporations and industry events. Ms. Cruz also assists clients in setting up corporations and organizations in the Philippines, concluding various commercial agreements, and providing general corporate, taxation, and border protection advice. She brings to the practice a diverse international experience, having interned at Frommer Lawrence & Haug LLP and at Kaye Scholer Fiermann Hayes and Handler, both in New York, U.S.A.
As part of her commitment to positive social change in the community, Ms. Cruz actively helps various non-governmental and non-profit organizations regarding their legal issues. She also serves as director and corporate secretary of several corporations.